Triple B Bungalows is centrally located on the quieter 'Songserm' Road, 5 minutes from the beach and 5 minutes from 'down town' Mae Had, where all the major facilities are located alongside many quality restaurants and bars. Should you wish to walk the island, it is 15 minutes to Sairee and 20 minutes to Chalok. For the more adventurous, many of the jungle walks begin here. It is also possible to rent scooters, cycles and quads nearby. 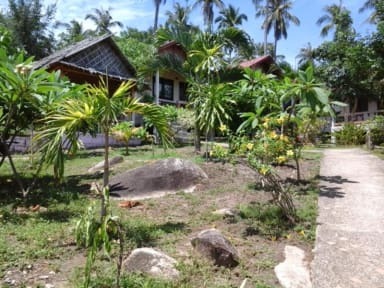 All the private bungalows are surround a beautiful, relaxing garden. 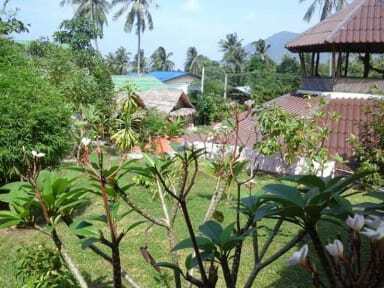 There are 5 traditional Thai bamboo bungalows. 3 are single bed and 2 are double bed. All come with fan, electric sockets, pillows, sheets and mosquito nets. The bamboo residents have shared bathrooms, towels included. 7 concrete bungalows are also available. 2 are twin beds and 5 are double beds. All come with fan, fridge, electric sockets, pillows, sheets and en-suite bathrooms with towels included. On arrival you come to the covered common area where the restaurant, bar, outdoor lounging area and roof top 'skybar' is situated. The Thai restaurant boasts some of the best Thai food on the island and is open for breakfast, coffee and tasty delights until 21:30. The bar serves Thai, Belgian beer and cocktails, with the owners, Tom and Tei, speaking English, French, Dutch and Thai. Tei can also be persuaded to teach you all you need to know about Thai cooking, many of the herbs can be found right here in our garden. This is budget accommodation at its best. 1. Check in from 10:00am and check out until 10:00am. 3. Cancellation policy: At least 2 day advance notice before the arrival date is required. 4. The reception is open from 07:00am to 21:00pm. 5. In week-ends, we sometimes have some noise from a lounge club nearby, but closing time is 2am on Koh Tao. 6. Please note that the single bamboo huts are very small backpacker huts, so tall people might rather go for a big bamboo or a concrete bungalow.